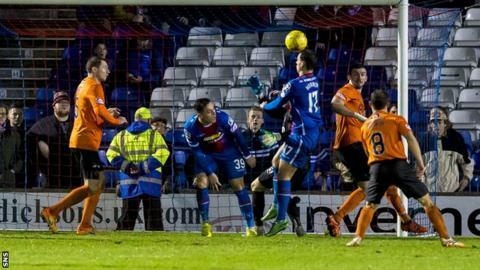 Mixu Paatelainen refused to back up goalkeeper Michal Szromnik's claim he was fouled in the build-up to Inverness CT's dramatic injury-time equaliser. The Dundee United manager was shattered that Lewis Horner's header denied his team what would have been only a third league win this season. He said: "It wasn't a foul in my mind and the referee saw no foul either. "There were plenty of positives but it wasn't enough to win the match and today was a glorious chance to win." Szromnik was booked by referee Craig Thomson after complaining that he was impeded going for Danny William's deflected cross that was eventually headed just over the line by Horner. Inverness manager John Hughes admitted he was not sure if a foul had been committed but Paatelainen was in no doubt about where the responsibility lay for only picking up a point. "We are getting closer but we need to make sure that we don't concede those stupid goals and they are stupid, stupid goals," Paatelainen told BBC Scotland. "Decision making in certain areas and certain situations cost us dearly again. "Credit to Caley Thistle as they played well and put us under a lot of pressure but I thought the boys battled and defended really well. "But when you lose a goal like that with half a minute to go it always hits you, but especially given where we are. "It would have been a valuable three points but it wasn't enough in the end to get them." Former Caley Thistle players John Rankin and Billy Mckay scored Dundee United's goals while Liam Polworth had hauled Inverness level for the first time seconds into the second half. It was left to Horner to score his first ever goal for the Highlanders - a header that clearly crossed the line before Mark Durnan could hook it clear. Hughes said: "He was a kid with me at Hibs and Lewis has been very patient when it comes to getting his chance. "It's his second year here but what he has done is keep himself really fit and ready to take his chance when it comes along. "We were shouting from the bench that he could be the match winner because he was getting in on that back post. "I'm really glad for him because he was outstanding when David Raven got sent off and he came in and did well against Motherwell and Partick. He has kept his head and taken his chance." However, like his Tannadice counterpart Hughes had mixed feelings about missing out on the chance to get all three points after an entertaining match with plenty of goalmouth incidents. He added: "I feel we deserved to win the game as we had enough chances to do that and I felt that we dominated the game for 90 minutes. "I am honest enough to say there were times when Dundee United had a foothold in the game but they scored against the run of play. "I was really disappointed with their second goal as it was self inflicted and you need to know the fundamentals of the game and what needs to be done. "But they showed plenty of spirit and character to keep fighting to get that late equaliser. "However, they need to be ruthless and take more of our chances as we certainly created plenty today which was pleasing."